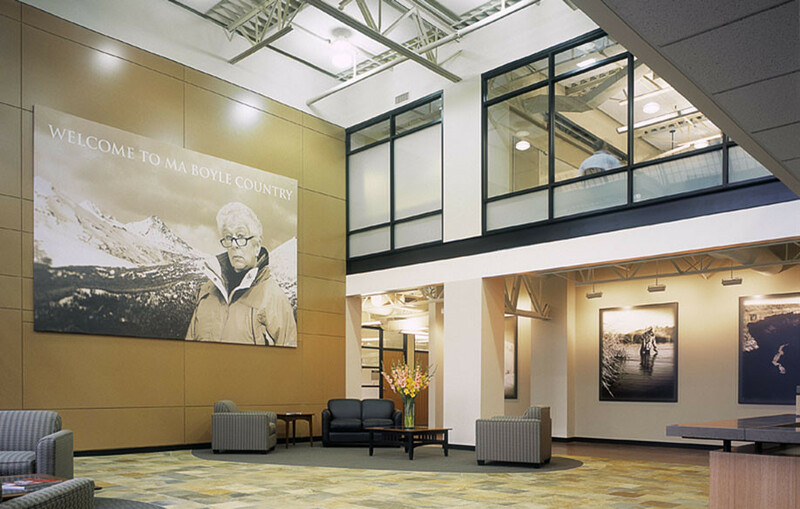 For a rapidly expanding, iconic Oregon company, the Columbia Sportswear Company Corporate Headquarters project involved the purchase and renovation of an existing high tech manufacturing facility in Washington County, Oregon and conversion to a unique corporate headquarters. The two story steel and concrete structure was transformed into executive and management offices, research and development, data center, and showroom facilities for over 400 employees. Three distinct building areas are joined by a meandering circulation spine nicknamed the Columbia Trail which together with skylights, peeled log timbers and columnar basalt stone creates a distinctive and relaxing experience while moving through the facility. Exponential company growth at the time forced an aggressive schedule. By following an advanced “design while building” project management plan created by the development team, the project met an immovable 11-month schedule from date of close on the real estate transaction to employee move-in.